The French Revolution was a 1789 revolution which began the modern era. In a sequence of upheavals, it saw the downfall of King Louis XVI, rise of Robespierre and the Reign of Terror, a chaos wherein thousands were guillotined for political differences. Radicals saw the Catholic Church as the enemy and promoted in its place a Cult of Reason. The Revolution emerged in part from the rationalism of the Enlightenment which distrusted all established institutions. It inspired fear into European monarchs and aristocrats as well as conservative intellectuals like Edmund Burke in Britain, who mobilized to fight the Revolution, and finally succeeded in 1815. Before the Revolution, France had three levels in its social system: The First Estate (The Clergy), Second Estate(The Nobility) and Third Estate(Anyone else). The First Estate consisted of about 0.6%. It owned roughly 10% of the land, which it rented to peasants in return for a proportion of crops produced. On top of this it collected tithes, a tax on the income of parishioners, which was meant to contribute to the upkeep of the local clergy. The First Estate were exempt from most taxes because of the Church's role in poor relief, health care and education, and instead they paid a voluntary gift called the don gratuit to the monarchy. The Church paid this annually, and decided how much it would pay and varied depending on the power of the King or the mood of the Church, which was usually about 5% of its income. The Second Estate was about 2% of the population and they controlled 20% of the land. These were the nobility, and they too paid very little taxes. The Third Estate was everyone else, and they were badly overtaxed by the monarch. This overtaxing was one of the major causes of the French Revolution. The leaders of the Third Estate were the upper middle class, especially lawyers; they are called the bourgeoisie. They were educated in the ideas of the Enlightenment, most importantly Jean Jacques Rousseau. Rousseau's book, "The Social Contract" supported a direct democracy. The social contract spoke against titles for nobility and demanded complete equality for all people. French Revolutionary ideals, especially thanks to Napoleon, later inspired liberal and democratic movements of the 19th Century. Several costly wars, the War of Austrian Succession (1740-8), the Seven Years War (1756-63) and the American Revolution (1778–83), had reduced the government to the verge of bankruptcy. The deficit for 1786 would be 112 million livres, nearly a quarter of total income. Due to the poorly organised taxation system it was impossible for the King and his finance minister to make up the deficit without serious reforms. In 1787 he called a meeting of 144 leading nobles, the Assembly of Notables, to attempt to persuade them to pay tax in return for increased powers. The nobles refused his requests and were supported by the local assembly; the Parlement de Paris. Outraged at this perceived slight to his authority, King Louis exiled the Parlement to Troyes on 15 August 1788. The result was an aristocratic revolt, supported by members of the clergy around the country. Although fragmented and disorganised, the revolts continued until the King withdrew his demands at this challenge to his authority, which was greeted by thousands taking to the street to celebrate. When troops were ordered to "Get some lead into the bastards' backsides", they fired into the air instead. In hindsight this can be seen as the start of dissent. It is notable that the initiators of this unrest were the upper classes, who had little reason to think there was any thirst for revolution. In April 1787, Calonne resigned in disgrace and the middle classes, strengthened by the protests, began to demand the Estates-Generale, a Parliament in which they would be represented. With growing unrest and France nearing bankruptcy, the King agreed to call the Estates-Generale in May 1789. The Estate-Generale was divided into the three estates, with the first two estates (nobility and clergy) electing their representatives. The third estate representation required a series of elections in which all property owners over the age of twenty-five were eligible to take part. They elected a group of electors, who in turn chose delegates. The delegates themselves were overwhelmingly middle class, including the young lawyer Maximilien Robespierre. Furthermore, the Third Estate was required to produce a list of grievances known as cahiers. Between 25,000 and 60,000 documents were filled with grievances. Thousands demanded a constitution, reorganization of the clergy, lessening of the tax burden and an end to Royal waste. Few of these demands could be resolved without challenging the basis of Absolute Monarchy. However, not one of these document has been found to advocate abolition of the monarchy, with the large majority requesting moderate reform and many including expression of adoration towards the King. The Estates-General had not met in 175 years and retained many of its former characteristics. Each Estate had one vote in the Assembly, such that the First and Second Estates could always outvote the Third Estate. That was acceptable in the early 1600s, but the Third Estate would not allow this in 1789 after learning the Enlightenment ideas. King Louis XVI responded to the Third Estate's complaints by doubling the number of Third Estate delegates in the Estates-General. By this time the alliance between the nobility and the third estate had broken down; the nobles may have called a march, but they drew the line at burning down tax offices. The Third Estate wanted a system of one vote per delegate, which would have given the Third Estate the same number of votes as the First and Second Estate combined. The opening of the Estates-Generale did not bode well. The opening session was in an open coach house, which meant that the Third Estate struggled to hear the proceedings as they were on wooden benches at the far end of the room. Upon the entry of the King, the first and second estates were expected to remove their hats and sit down after the King, before replacing their hats. The Third Estate were expected to remain standing until after the first and second estates had replaced their hats, however, they chose to sit at the same time as the first and second estates. The First Estate were to wear glittering robes, the second estate were to wear silk coats, whilst the third estate were required to wear black coats. There was no question at this point of rudeness towards the King himself, and at this point none of the delegates (including Robespierre) was a republican in their beliefs. There then followed a speech by Necker on possible solutions to the economic crisis, that was of such length and dullness that Necker had to pass it on to a delegate to complete. The Third Estate began to win votes in the Estates-Generale by attracting poorer clergy to their side. On 17 June the Third Estate, accompanied by the poorer clergy, voted 490 to 90 in favour of a motion to call themselves the National Assembly and claimed that they now had the right to manage the nations affairs and taxation. In an attempt to reassert his control, the king announced that Estates-Generale was postponed until 23 June where he would announce several reforms in a seance royale. However, news of the postponement did not reach the delegates of the Third Estate, who arrived on the 20 June to find the room locked. Following a period of confusion, Dr Guillotin (one of the Third Estate delegates) suggested it might be possible to convene at a nearby indoor tennis court and the group of over 500 delegate proceeded to meet at the court. The session was chaired by Bailly (a celebrity astronomer) and Mirabeau proposed that the delegation should not break up until a constitution was passed, which was opposed by only one delegate (Martin d'Auch). In effect the delegates had declared themselves the Government of France, pending a constitution to be organized by Mirabeau. The National Assembly approved the “Declaration of the Rights of Man,” which combined ideas of the American Declaration of Independence with some Enlightenment concepts. The result of this combination had many debatable claims. The entire document is short and worth reading in full:  . The King responded by ordering the delegates to disperse, however this had little effect. The following week the King sent a messenger, the Marquis de Breze, to order the finishing of the session. Mirabeau ordered the messenger to leave. In the last week of June the royal Government ordered 20,000 troops to march on Paris. It became apparent that compromise was not working. This was emphasized with the replacement of Necker by the hard line Baron de Breteuil. Thousands took to the streets to demand the reinstatement of Necker, who was at the height of his popularity and seen as the only man who could solve the taxation crisis. Mirabeau spoke to the assembly, invoking the oath taken at the tennis court. Camille Desmoulins had ridden to Versailles to report on events and galloped back to Paris to report on the replacement of Necker. Crowds marched to Abbaye prison to demand the release of the soldiers who had been arrested for not firing on the crowds. Troops were offered drinks by the crowd if they shouted 'Viva le tiers-etat'. Dummies of Necker and Duc d'Orleans were stolen to be paraded as heroes. The deputies were now faced with a dilemma, requiring a mass movement for defence of the National Assembly, but fearing crowds getting out of control. Militia were therefore established, that excluded all unemployed and vagrants, and many districts demanded employers' references before admission. Admission varied enormously across districts, with 1,200 being recruited in Le Petit-St-Antoine, but Les Minimes mustering four. With the militia formed to repel the royal troops, there was an urgent need for weapons. The royalist Swiss Guards had stored 30,000 pounds in the Bastille, to be used against the National Assembly. On the morning of July 14, 1789 (“Bastille Day”), a crowd of about a thousand people made up predominantly of small tradesmen arrived at the prison to demand the gunpowder be handed over. The prison Governor invited a delegation in for breakfast, which proceeded for three and a half hours. Meanwhile, rumours circulated that royalist troops were committing atrocities across Paris. A demonstrator outside the Bastille realized he would be able to get to the chains of the drawbridge by climbing from a nearby perfume shop. At this point, the prison Governor, De Launay, broke off negotiations and late in the afternoon cannon shots were aimed at the crowd. Two companies of French Guards were persuaded to the Bastille to the defend protesters being killed by cannon fire. A Swiss Guard handed over the keys to the second drawbridge, leading to a moat. A clerk from a pawn office visited a carpenter and returned with eleven pieces of wood, one of which was able to span the moat. Once inside, seven prisoners were freed. In total six defenders of the Bastille were killed, including De launay, and ninety protestors. The aftermath was one of euphoria throughout much of Paris. Much of the nobility proclaimed support for the act, realizing that it was not healthy to oppose public opinion on the matter. Louis XVI recalled Necker to his job and agreed to recognize the National Assembly, which included the Third Estate delegates, poorer clergy and nobility sympathetic to the Third Estate cause. Lafayette was appointed head of the police and the army, which was to be known as the National Guard. Bailly became the Mayor of Paris. The King agreed to come to Paris and accept the gift of a cockade that had become a symbol of the revolution, which the king fastened to his hat, whilst the crowd cheered "Vive le Roi!". Whilst the significance of the day was evident, that it would produce a republic was far from clear. The plan of the King to take Paris with 20,000 troops had failed, but he was able to satisfy the populace that it was not intended and a peaceful resolution was reached. The changes that had so far occurred in a brief period of time were so dramatic that the thought that things could change further was difficult to conceive. During the week following the storming of the Bastille, news of events spread to the rest of France. This led to a panic as to what the response of the nobility would be to the events, The Great Fear or panic resulted. Many villages defended themselves against imaginary threats by forming peasant militias; riots occurred and peasants proceeded to burn wealthy homes. The rural uprising prompted the National Assembly to pass a motion to 'destroy the feudal regime entirely', on August 4. However, in order to release himself a peasant would have to pay twenty times his annual rent to the landlord, making the measure ineffectual. The Assembly in August 1789 passed the Declaration of the Rights of Man and of the Citizen on the 4th August. This annulled the right of nobles to demand taxes, tithes and labor from peasants working on their family land. The declaration was inspired by the American Revolution and was partially written by LaFayette. Some declarations were troublesome; “Every citizen may, accordingly, speak, write, and print with freedom, but shall be responsible for such abuses of this freedom as shall be defined by law” left questions of definition. Also, the rights of French people to rebel were enshrined in the very constitution itself. The water wheel was abolished as the method of execution by the more humane and scientific guillotine. It is notable that the only delegate to vote for the abolition of the death penalty was Robespierre. France was slowly becoming a republic. Although the United States was well known as a republic, a European republic was still alien to the thoughts of most French, including revolutionaries. Negotiations over the new constitution continued, with Mirabeau and Lafayette appealing for calm less the King withdraw from negotiation. Jean Paul Marat took a less moderate line. Marat argued for universal suffrage and for the King to retain only an advisory role, a constitutional monarchy such as those seen in the United Kingdom or Sweden to this day. In July 1790 on the first anniversary of the storming of the Bastille a large ceremony was held in Paris at which members of the Government and the King pledges themselves to uphold the 'law, the nation and the King'. This represents a compromise in that the King was still seen as central, however all pledges had previously been to the King alone, and the King was required to make no pledge. In the two years following the storming of the Bastille French society had been transformed. There were an estimated 133 political journals in Paris, Parish priests had been dismissed and replaced by elected Priests. Robespierre had advanced plans for the emancipation of Jews and Protestants, equal treatment of all military ranks and the abolition of the property qualification for the National Guard. Robespierre remained incorruptible at this point, refusing to be the Duc d'Orleans let the luxury affect his judgment. This situation was intolerable for the Royal Family, who began to organize a foreign force to invade France and restore their power. In December 1790 Louis wrote a secret note to the King of Prussia requesting a European army invade France. Furthermore, the King and Queen (herself Austrian) decided to flee Paris to help organise the invasion force from without France, let their presence in Paris compromise the invasion. The royal couple decided to disguise themselves and flee across the border, which they did at night setting off at at a seven miles in part due to the weight requirements for the Queen to travel in the least luxury that she expected. The next morning the Kings letter to the National Assembly was found condemning all the measure which he had claimed to support for the previous two years. The royal party reached Ste-Menehould, where the papers of the party were checked by Drouet, who had been a staunch supporter of the revolution. Despite having seen the servant in the corner and 'struck by the resemblance of his face to the likeness of the King printed on the bank note', in disbelief he allowed the party to continue. Having discussed the incident with his colleague, Guillaume, the two raced to catch up with the party and spread word through the surrounding villages that the Royal family were attempting to flee. The family were captured and returned to Paris, with posters informing the gathering crowd "Whoever applauds the King will be flogged; whoever insults him will be hanged". Most delegates wished to hold together a compromise, but the Head of State fleeing to lead a hostile invasion of the nation had created difficulties. Many insisted that the King must have been kidnapped. General Bouille wrote a statement confessing his involvement, but many insisted he was lying to implicate the King. While the only punishment towards the King was stripping of his powers of veto on laws and finance, talk began to emerge for the first time of the possibility of a republic. At this point Robespierre and most of the Paris commune strongly opposed the republic, whilst Lafayette rallied to the slogan 'The Revolution is Over'. By then the French Revolution was in full swing. Politics in France became divided between the moderate Girondins and the more radical Jacobins. At this point the Girondins appeared to be in the stronger position, however the Jacobins were growing in strength. At this point the Jacobins were led by Robespierre, who made a strong speech in favor of a republic. The French National Assembly established a constitutional monarchy and, in 1791, adopted a new constitution that created a Legislative Assembly. Three factions quickly formed in the new Legislative Assembly, known as the radicals (liberals), moderates (centrists) and conservatives, similar to those political movements today in the United States. The three factions sat in different sections of the large assembly hall, with the radicals (liberals) sitting on the left, the moderates sitting in the center, and the conservatives sitting on the right. That gave rise to the left-center-right terminology that we still use today in the United States to describe these three political groups. A large number of noblemen had gathered in Koblenz to form an army to invade France and restore the King to full rule. The emigrants carried stories of atrocities and encouraged reaction against the National Assembly and atrocities associated with lower class democracy. The Duke of Brunswick declared "We will soon be marching on Paris". This was a matter of some concern in France, as many of the officers that had been in the French army in 1789 had joined the emigrant army in Germany. The Girondins remained confident, but Robespierre saw little cause for initial optimism. The Royal Family strongly supported war with the Prussian and Austrian force in the hope that the French would be defeated and they be restored. On April 1792, the King declared war on the Hapsburg Empire, who wished to restore his power. The French army suffered a series of defeats along the border, creating optimism in the Royal house. The National Assembly ordered the dispersal of the Kings bodyguard who were supporting the foreign invasion, but this was vetoed by the King. The Assembly then voted for 20,000 French patriots to come from across France to protect Paris, but this was also vetoed by the King. The use of the royal veto to undermine the defense of France prompted a strong reaction, with demonstrators managing to pour into the royal apartments. The King was forced to wear a red cap while being taunted for several hours with taunts of "Fat Louis" and "Tyrants must Tremble". The time of compromise was nearing an end. Lafayette planned a coup to restore the old order to as it was in 1787, using the National Guard. This force was resisted by a volunteer group of citizens. Traditionally this latter group are portrayed as ne'er-do-well criminals, however it is questionable whether such groups would march typically 800 miles. The volunteer groups were greeted as heroes in towns they passed through and Rouget de Lisle composed 'La Marseillaise' as a call to arms. The war started badly for the French and on 25 July the Duke of Brunswick prepared to March on Paris and pledged to restore the French Royal Family to their original statue, but that he had no intention of meddling in the internal affairs of France. He demanded total surrender or the Prussian and Austrian armies would "take an exemplary and never-to-be-forgotten vengeance, by giving up the town of Paris to military execution..and the guilty rebels to the death they deserve". Paris was divided, with 20,000 signing a petition to support the full restoration of an absolute monarchy and a foreign army was invading France rapidly. Moderates such as Mme Roland supported withdrawal from Paris, whereas Maton would accept no backward step. On 10 August a larger demonstration marched on the palace demanding the removal of the King. The National Assembly called for volunteers to defend the state, with assurances that this army would be different to the one that had gone before and collapsed before the troops of the Duke of Brunswick. The soldiers would sing Les Marseillaise into battle and officers and men would wear similar uniforms. The majority of the officers would be voted for by the soldiers. In September 1792 the army was formed, and the Duke of Brunswick brought his army round to meet the French on by the village of Valmy. The French were grouped around a windmill in an area of uncommon tranquility. The battle involved a day long exchange of cannon fire with little result. The significance of the battle is that the French volunteer troops remained firm. Johann Goethe was present at the battle, as one of the troops of the Duke of Brunswick; "In the morning we had been talking of spitting and eating the French. Now everyone was thinking again. Almost everyone remained silent. Only a few men spoke and their reflections seemed illogical or frivolous". In the opinion of Goethe, what had changed in the French was their spirit. They had won their freedom and did not wish to return to the days before the revolution, they had debated and were politically active. They were therefore able to stand firm. The news of the battle had a strong effect on French national morale, as the French came to believe they could win. 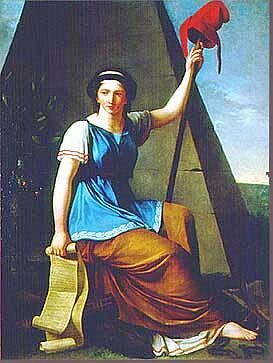 On the day following the victory Valmy in September 1792, the newly elected French Government (the Convention). The Convention declared France to be an 'Indivisible Republic'. The Convention was made of three factions; the Girondins, the Montagnards (including Robespierre, Danton and Marat) and the Grenouilles de la Marais or the Plain. Robespierre won an argument to allow a public gallery for debates. All factions favored deposing the King, but were far from united beyond that point. The Montannards saw this as the first step to greater social equality, as opined by Robespierre, "Royalty has been destroyed, not the reign of equality is beginning". He attacked the wealthiest businessmen "those goods which are necessary to keep people alive as nothing more than an ordinary item of trade" - a sentiment echoed later by Karl Marx's assertion that businessmen see objects not for their usefulness but for their value as commodities. However, the Jocobin position was far from modern Socialism, as they sought a nation of small property owners. The Government would be elected by property owners. Support for a republic was recently and had little idea of how to progress with the power they now found they had. The Girdondins accused the Montagnards of preparing a dictatorship. However, the Girdondins had lost credibility by suggesting retreat from Paris and furthermore lacked the social roots that enabled the Montagnards to motivate thousands of volunteers. It reflects on the differing social backgrounds of the delegates that it was at this point Robespirre met a cabinet maker, M. Duplay. Duplay invited Robespierre back to his flat to meet his family and, finding that the family had been trying to let a spare room, Robespierre moved in. It is worth considering the contrast between the setting of the reign of Louis XVI to Robespierre who, whilst the most powerful man in France, has to queue behind his landlord to use the toilet in the morning. The King and family were detained in the Temple prison, but retained the trappings of luxury. The King had a library of 1,500 books, still ordered his shoes from his preferred cobbler and the family was provided with servants. The majority of servants remained utterly devoted to the family, feeling their employment to be a sacred duty. This loyalty was not universal however, a former locksmith of the King revealed to the Paris Commune that there is secret cupboard containing correspondence between the King and invading powers showing collusion. Mirabeau and Lafayette were also implicated, though Mirabeau had now died and Lafayette had fled to Austria. The trial was debated by a number of key speakers. Louis St-Just debated the very validity of Kings, that to try the King as a bad King suggested it was possible to be a good, legal King, which was not acceptable. He was opposed by Thomas Paine who wished the King to be exiled to the United States. The vote was won for death by 387 to 334. Louis XVI was executed in January 1793. The challenge to the rich, powerful Catholic Church came at first from intellectuals, who secretly circulated pamphlets that undercut traditional dogma. Some promoted atheism. The early years of the Revolution reversed the power relationship between belief and unbelief in France. The established Church was discredited, leading priests and bishops were forced into exile or executed, its churches and seminaries closed, its beliefs and rituals held up to ridicule. A strident unbelief became a political factor in public life, as seen in the intensity of the anticlerical dechristianisation. The French Revolution inspired skeptics across Europe to put the irreligious ideas of the Enlightenment into practice. A vital force intended to sustain the political and economic terror was the creation of an ideology based on love of la Patrie, "the Country" or "fatherland", and the subjugation of the individual to the collective will of whole. The Church of Notre-Dame-de-Paris became a temple of Reason, and the feast of Reason was celebrated on 10 November. The idea of honouring the fatherland, which had its origin in the festival of the Federation in 1790 gave rise to successive cults. Chamber Deputy Laloi commented they had "wiped out eighteen centuries of error". Robespierre adopted the position that from the religious and Republican standpoint the idea of a Supreme Being was advantageous to the State, that religion should dispense with a priesthood, and that priests were to religion what charlatans were to medicine, and that the true priest of the Supreme Being was Nature. The Convention adopted a decree stating: "The French people recognize the existence of a Supreme Being and the immortality of the soul". It announced that freedom of worship is maintained but adds that in the case of disturbances caused by the exercise of a religion those who "excite them by fanatical preaching or by counter Revolutionary innovations", shall be punished according to the rigour of the law. Thus the condition of the Catholic Church remained equally precarious and the first festival of the Supreme Being was celebrated throughout France on 8 June 1794. with aggressive splendour. Whereas the Exagérés wished simply to destroy Catholicism, and in the temples of Reason political rather than moral doctrines were taught. Robespierre desired that the civic religion should have a moral code which he based on the two dogmas of God and the immortality of the soul. He was of the opinion that the idea of God had a social value, that public morality depended on it and that Catholics would more readily support the republic under the auspices of a Supreme Being. During the first days of the Republic, provision had been made for dating public documents from "the first year of the French Republic," but no definite plan for a revised calendar had been proposed. A decree of 2 January 1793, provided for the second year of the Republic to begin on 1 January 1793. The new calendar lasted until 1806. Instead of Sunday, the new calendar had a ten-day week with a rest called "décadi," every tenth day. It hardly mattered—few peasants used calendars in the first place, and the religious-minded kept track of holy days they celebrated in secret. The Committee of Public Safety was formed in April 1793, and passed a rule that Generals were to live in camp with the army. This had the practical effect of testing the belief in equality of the many Nobles in the army. General Dumouriez made overtures to the Prince of Coburg for the invasion of France and have Louis XVI's son proclaimed King Louis XVII. The execution of Louis XVI led almost immediately to the Reign of Terror in 1793-94. Maximilian Robespierre, head of the Committee of Public Safety, proceeded to guillotine numerous alleged enemies, including Marie Antoinette. In a classic illustration of Jesus’s teaching that “he who lives by the sword dies by the sword,” Jacobin leaders Georges Danton (a fiery orator) was guillotined, and Jean-Paul Marat (a scientist) was stabbed to death in his bathtub. Marat's death by Santiago Rebull. By 1794 many countries, including Great Britain, Spain, the Netherlands, Prussia and Austria, had formed the "First Coalition" to invade France and restore monarchy. The National Convention responded by drafting people into an army. Historians claim women were drafted, but such a politically inspired claim is worth investigating before accepting it. The war lasted for several years, on several fronts, but the First Coalition was eventually defeated. Robespierre made a fatal mistake on 26 July (8 Thermidor on the revolutionary calendar) when he made a speech attacking colleagues who he claimed were plotting against his government. He declined to name those he suspected, allowing moderates and terrorists (here used to refer to members of the government who supported the Terror) who felt threatened a chance to act. Had he named anyone they would immediately have been arrested and executed. Instead, the next day, when Robespierre attempted to speak at the Convention he was shouted down. Finally, after a farcical arrest and release due to popular support, Robespierre was arrested a second time, and executed the same day, 28 July. At last the government of France was in the hands of a legislature, and an executive branch of five men called the Directory. The Directory picked a young, highly successful military genius named Napoleon to lead the French army. The very next day Napoleon seized all power in France as its dictator, in November 1799. On 29 September 1793, in the Law of the Maximum was formulated to deal with the steady rise in prices of the necessities of life. Committees of experts had been appointed to study the whole subject. Prices were set at one and one-third its price in 1790, transportation costs were regulated at a fixed rate, a 5 per cent markup was allowed the wholesaler and 10 per cent to the retailer. Bertrand Barrere declared, "The needs of the people will no longer be spied upon in order that the commercial classes may arbitrarily take advantage". The first result was farmers produced as little as they possibly could. Scarcity increased, and the people of the large cities were put on an rationing. Many shopkeepers went out of business, and the remainder forced buyers to pay enormous charges under the very natural excuse that the seller risked his life in trading at all. That this excuse was valid is easily seen by the daily lists of those condemned to the guillotine, in which not infrequently figure the names of men charged with violating the Maximum laws. Manufactures were crippled and frequently destroyed. To detect goods concealed by farmers and shopkeepers, a spy system was established with a reward to the informer of one-third of the value of the goods discovered. To spread terror, the Criminal Tribunal at Strassburg was ordered to destroy the dwelling of anyone found guilty of selling goods above the price set by law. The farmer often found that he could not raise his products at anything like the price required by the new law; and when he tried to hold back his crops or cattle, alleging that he could not afford to sell them at the prices fixed by law, they were frequently taken from him by force and he was fortunate if he was paid in the depreciated fiat currency or escaped execution. The Convention decreed that any person selling gold or silver coin, or making any difference in any transaction between paper banknotes (assignats), and precious metal coin (specie) should be imprisoned in irons for six years; that anyone who refused to accept a payment in assignats, or accepted assignats at a discount, should pay a fine of 3,000 francs; and that anyone committing this crime a second time should pay a fine of 6,000 francs and suffer imprisonment 20 years in irons. Later, on 8 September 1793, the penalty for such offences was made death, with confiscation of the property of the heirs, and a reward offered to any person informing the authorities regarding any such transaction. The Convention decreed, in May 1794, that the death penalty should be inflicted on any person convicted of 'having asked, before a bargain was concluded, in what money payment was to be made". Georges Couthon, in August 1793, proposed and won passage of a law punishing any person who should sell assignats at less than their fixed value with imprisonment for 20 years in chains, and later passed a law making investment in foreign countries punishable by death. Prisons, guillotines, enactments inflicting 20 years' imprisonment in chains upon persons twice convicted of buying or selling paper money at less than its nominal value, and death upon investors in foreign securities, still did not stop people from procuring the necessities of life by bargaining and exchange; on 1 August 1795, the gold louis of 25 francs was worth in paper, 920 francs; on 1 September, 1,200 francs; on 1 November, 2,600 francs; on 1 December, 3,050 francs. In February 1796, it was worth 7,200 francs or one franc in gold was worth 288 francs in paper. Prices of all commodities went up nearly in proportion. The "Directory" was the government between November 1795 and November 1799. It consisted of a Directory of five men, one of whom was replaced annually, and two representative assemblies, the Five Hundred and the Ancients. The assemblies were elected nationwide by property owners. The assemblies wielded legislative power, and the Directory executive power, but there was no device to resolve deadlocks between them. The Directory gave power to the more conservative forces remaining in France; they had taken advantage of the enormous changes 1789-95, including the breakup or religious and aristocratic estates. The Directory continued the "Thermidorian reaction," which followed the fall of Maximilien Robespierre and the Jacobins in July 1794. The moderate middle-class republicans, mostly from the upper middle class favored the Directory because it ended the power of the royalists on the right and the Jacobin on the left. The Directory repeatedly used armed force and intimidation to stay in power, and thus depended on its generals, who gained popularity. In foreign affairs the wars against Britain, Austria, Prussia, and for a time Russia were undertaken to protect France, expand its ideals, and acquire cash to pay army, which became more and more powerful in internal affairs. Conquests created a screen of six satellite republics set up in Holland, Switzerland, and Italy, and Bonaparte's seizure of Egypt. Prussia and Spain made peace, but Britain remained hostile and plans were drawn for an invasion. Instead Napoleon invaded Egypt. In domestic affairs the era of the Directory was characterized by large-scale corruption. The revolution had demoralized public life, especially in Paris and the major cities. Profiteering in business, graft in politics and bureaucracy, extravagance in luxuries, and vulgarity in morals and manners, were the marks of the new regime. Public finances remained disorganized, as the nation could not raise enough taxes to pay its expenses. Inflation was rampant. In the private sector prosperity was returning, especially in the rural areas where most Frenchmen lived. One Director, Paul de Barras (1755-1829), who clung to power throughout the period, was a flamboyant, ruthlessly self-seeking man of immense greed and licentiousness. In total contrast was Lazare Carnot (1753-1823), the patriotic "organizer of victory," who served as a Director from 1795 until September 1797, and was largely responsible for the successes of the French army and of the Italian campaign in 1796-1797. Senior officials included the highly talented Joseph Fouché, minister of police, and the Comte de Talleyrand, minister of foreign affairs. The election as director of abbé Emmanuel Joseph Sieyès in May 1799 brought in a powerful intellectual who realized the system was doomed and resolved to overthrow it. The Directory lost legitimacy by the series of coups it engineered to control elections. The coup of Fructidor (September 1797) against the royalists was followed by the coup of Floréal (May 1798) against the Jacobins, and then by that of Prairial (June 1799) against both. Repeated use of armed intimidation dismayed republicans, particularly army officers who believed in republican ideas. The coups paved the way for the overthrow of the regime by Napoleon in 1799. Despite his military failures in Egypt, General Napoleon Bonaparte returned to a hero's welcome in 1799. In alliance with the director Sieyès and his brother, Lucien Bonaparte, president of the council of five hundred, he overthrew the Directory by a coup d'état on November 9, 1799 ("the 18th Brumaire" according to the revolutionary calendar), and closed down the council of five hundred. Napoleon became "first consul" for ten years, with two consuls appointed by him who had consultative voices only. His power was confirmed by the new constitution ("Constitution of the year VIII"), originally devised by Sieyès to give Napoleon a minor role, but rewritten by Napoleon, and accepted by direct popular vote (3,000,000 in favor, 1,567 opposed). The constitution preserved the appearance of a republic but in reality established a military dictatorship. Historians usually date the end of the Revolution with the days of Brumaire, as it sounded the end of the short-lived French republic: there was no more representative government, assemblies, a collegial executive, or liberty. The soldiers of the 1790s became the heroes for future republicans, who admired the equality of all before the draft, the requirement to serve in person, the human qualities of flair, enthusiasm, generosity of spirit, and patriotism, as well as the upward mobility that could turn peasants into officers. The soldier was spared the denunciation heaped on one political faction or the other. The influence of the French Revolution was immense throughout the western hemisphere, as other peoples felt that they, too, could rise up against their rulers and defeat them. Historians credit the French Revolution with spreading the ideas of the Enlightenment, limiting the power of nobility and clergy, and ending an absolute monarchy. But many who supported the French Revolution in its beginning were horrified by where it led, including numerous executions and terror. Some would say that France never fully recovered, as the French Revolution unleashed a hostility towards Christianity that continues to this day in France. The French Revolution was also indirectly responsible for the creation of Communism under Karl Marx and Frederick Engels, who had based their theory on the French Revolution, and by extension Jean-Jacques Rousseau. A first attempt at a Communist society was attempted with the Paris Commune of 1844, which crashed and burned and resulted in Marx being exiled from France. The Republican or "radical" interpretation of the Revolution, typified by politician François Guizot (1787–1874) and research scholar François Aulard (1849-1928), hailed it for the destruction of a reactionary nobility, which was replaced by men of the Enlightenment who introduced the rights of man, proclaimed equality, guaranteed liberty, strengthened the nation state, redefined citizenship, and modernized every aspect of France's political, social, cultural, religious, economic and diplomatic roles. He saw the duty of his own generation to continue and perfect the goals of the Revolution. The defeat of the reactionary Catholic Church was seen as a signal achievement, and bolstered the Radicals in French politics who attacked continuing roles of the Church in the late 19th and early 20th century. The arch-conservative Legitimist or "Bourbon" interpretation, typified by Joseph de Maistre (1753–1821) portrayed the French Revolution as an illegitimate, bloodthirsty usurpation of legitimate rulers. The Right in France rejected the Revolution and all its works. However, recent conservative historiography has argued that the Revolution accomplished only what was already underway, and added little new except needless violence and hatreds. The Roman Catholic variation stressed the attacks on religion and the established church, and the horrors of the Terror, thereby bolstering the political conservatism of the Catholics, whose schools were under attack by Radicals for much of the 19th century. Karl Marx had specifically taken into account the French Revolution (more specifically the Reign of Terror in 1793) when writing the Communist Manifesto with Frederick Engels. In their correspondences, Marx noted: “There is only one way of shortening, simplifying, and concentrating the bloodthirsty death-throes of the old society and the bloody birth pangs of the new--revolutionary terror. . . . [...] Once we are at the helm, we shall be obliged to reenact the year 1793. [...] We are pitiless and we ask no pity from you. When our time comes, we shall not conceal terrorism with hypocritical phrases. . . The vengeance of the people will break forth with such ferocity that not even the year 1793 enables us to envisage it. . . .” In addition, the Bolsheviks specifically modeled their revolution and the creation of the USSR after the French Revolution, and even planned a statuary line depicting various figures from the French Revolution, called Monumental Propaganda, to put into context the role of their revolution. The Marxist historians, for example Albert Soboul, George Rude and Peter McPhee, counter by pointing to the rise of the bourgeoisie class in power due to the abolition of seigneruial rights and privileges, claiming that the French Revolution was the starting-point for capitalist society and the modern democracy. Marxist historiography, which was dominant from the 1930s into the 1970s, argued that material economic factors made a revolution inevitable, gave it force, and made it a model for the 20th century socialists to emulate. Marxists, led by Albert Mathiez (1874–1932), Georges Lefebvre (1874-1959), and Albert Soboul (1914-1982), identify two stages, a liberal bourgeois revolution (1789) against the feudal landed aristocracy, followed by a second and more radical democratic revolution against the bourgeoisie led by the sans-culottes (the urban poor). That is, the wealthy town dwellers and businessmen (the "bourgeoisie") were angry that the nobility governed France. They found a voice (in Marxist language, they realized their identity as a class) and first sought power against the upper class (in 1789) and then (1791–99) against the proletariat (poor people) of the cities and peasants from below who suddenly emerged and demanded power themselves. The conflict permanently radicalized France and was the foundation of the Left in French political history. Marxists lament the counterrevolution of Thermidor and the coming to power of Napoleon. The Marxist approach was a simple model that claimed to simultaneously explain the Revolution's origins, its internal dynamics and its long-term consequences. The dominance of the Left in French intellectual life ensured the theory was dominant for decades, but it had serious flaws. As English scholar Alfred Cobban explained, feudalism as a system had withered away long before the Revolution abolished its last vestiges in the form of seigniorial rights. Furthermore, where Marxists saw a self-conscious, capitalist bourgeois class, Cobban revealed only a loose collection of disparate social groups that did not include the industrialists and businessmen but rather the officeholders and lawyers. These men led the revolution not as spokesmen for the forces of capitalism; rather they were state-builders. Other scholars showed the nobility was not parasitic obstructionist and reactionary caste of Republican or Marxist writing, but rather a diverse and open group whose leaders actively promoted political and economic modernization. To replace Marxist interpretations was the goal of François Furet (1927–97)), the head of the history section of the Ecole pratique des hautes etudes. He argued instead that the Revolution is best understood as the victory of the Enlightenment—particularly the Rousseauian version—over social interests. Intellectual forces were dominant, not class conflict or materialistic forces. Furet's influential American ally was Keith Baker, of the University of Chicago. Baker, influenced by the linguistic turn pioneered by J. G. A. Pocock identified three competing discourses that shaped how people thought in the second half of the eighteenth century. The "language of will" promised rights to the majority while the "language of justice" and the "language of equality" also shaped political values. Justice emphasized history and the desire to maintain contracts; proponents of equality wanted reason to prevail in governmental decision making. According to Baker, in the summer of 1789 the revolutionaries suddenly embraced the language of will. Once embarked on this course, the Terror followed from their insistence that the majority should realize its ambitions. Political and social factors were not necessary to arrive at this unfortunate result, said Baker; instead it was the embrace of the three political discourses of will, justice and equality that drove the revolution. Multiple cultural and intellectual themes have displaced monocausal economic interpretations. Thus in dealing with the middle class, the Marxist inevitable-class-conflict model has given way. On the one hand there are cultural studies that emphasize the ways in which the middle class functions as a political and moral claim rather than a sociological entity. On the other hand, microscopic ethnographic studies examine the middle class in terms of daily cultural practices, focusing on the formation of class identity through family structure, consumer behavior, sociability, and sexuality. In political and ideological terms the Revolution was no doubt of crucial importance, but humanity was not transformed thereby... At the end of all the political upheavals of the Revolution and Empire little had changed in the daily life of most Frenchmen. In other words, all the events of the French Revolution had little lasting effect on everyday life. Thanks to the postmodern emphasis on the specific rather than the general, instead of the old emphasis on Paris there has been much greater emphasis on regional and local conditions. Postmodern historians tend to see the French Revolution as a haphazard event with random and largely unforeseen consequences, to the dismay of old Marxists like Eric Hobsbawm (1917-2012). Since the 1980s historiographical perspectives have emphasized the global context of disturbances, riots, and revolts in Europe and the Americas--in the Atlantic world—in the late 18th century, with attention to similarities and differences. The comparative approach was pioneered by American historian Robert Palmer. Paxton, John. Companion to the French Revolution (1987), hundreds of short entries. ↑ John Hall Stewart, A Documentary Survey of the French Revolution, 1963. ↑ Catholic Encyclopdeia, (1911) "French Revolution"
↑ Andrew Dickson White, Fiat Money: Inflation in France, Foundation for Economic Education, Irvington-on-Hudson, New York, 1959, pp. 75-89; first published in 1912 as revised version of 1876 lecture. Reproduced in Choice in Currency, F. A. Hayek, The Institute of Economic Affairs 1976, "A Note on Government Monopoly of Money in Theory and History", France, 1789, pgs. 34 - 38. ↑ The Directory is also called the Constitution of the Year III because it was instituted in the third year of the First French Republic. ↑ Not including the royalists and aristocrats who had fled into exile. ↑ See Furet and Ozouf, eds. Critical Dictionary (1989), 881-1032 and Doyle Origins of the French Revolution (1999) ch 1-3, for a review of the major historians. ↑ Roger Price. An Economic History of Modern France, 1730-1914. London. Macmillan. 1975. This page was last modified on 9 April 2019, at 09:03. This page has been accessed 251,525 times.